We are looking for a Senior Level Designer to join our studio. Become a linchpin in transforming our award-winning crafted narrative worlds into their own reality! 8+ years and at least 2 previously shipped titles in a senior level design or environment world building role, with established track record of crafting engaging open world content. Work directly with the Creative Director on the vision and execution all world environment game spaces. Preparation (and at times presentation) of level design documentation. Ability to balance world aesthetics and gameplay needs within set technical limitations. Deep understanding of first-person combat and exploration survival game mechanics. Senior ownership of the world map design and its execution pipeline. Environment and level reviews at multiple stages of implementation to ensure the design execution matches the overall creative vision. Rapid block-out prototyping for conceptual layout. Applicants with in-depth and proven experience in Unreal Engine 4 will go to the top of the pile. Familiarity with inXile games and their licensed IP. Experience with additional aspects of design development: character design, quest & narrative writing, event scripting, and AI design. Open world, first person, survival game? Yes! My next question: online mode? Co-op? Both? Last edited by D-D on November 14th, 2017, 1:09 pm, edited 1 time in total. Re: inXile is making a survival game! Ark, Rust, Conan Xiles, The Long Dark, Oxygen Not Included, DayZ, Subnautica, Miscreated, The Forest, Hurtworld, H1Z1, Unturned, the Hunter: Call of the Wild, Life is Feudal, Astroneer, No Man's Sky, Empyrion, Dark and Light, Valnir Rok, 7 Days to Die, Citatel: Forged with Fire, Osiris: New Dawn, Subsistence, The Isle, Rising World, The Long Dark, Die Young, Next Day: Survival. Survival games are super popular right now, and if inXile makes a decent game in that vein, it could become their most popular title ever. It could do very well with Fig investments as well - IIRC, Fig's first ever project was an open world survival game by an unknown indie studio. Multiplayer or single-player? Obviously we don't know yet, but that will make all the difference in whether or not I care. Not to mention their kissing cousins like PUBG. Open world, first person, survival game? Please inXile, don't There many other studios doing such kind of games for those who like them - please focus on making 3rd-person RPGs as we love them ! Since so few are making them... that's what your fan love ! I assume this'll be a co-op game at minimum, probably using some of the experience they're getting from implementing Wasteland 3's multiplayer. Maybe this will also be the game to implement the "social features" Fargo had been planning for Wasteland 2. Share button, Instagram integration, in-game Discord chat, etc. That kind of social integration fits the modern survival genre like a glove. You're probably right. Not interested in multiplayer only games. I don't like playing on someone else's schedule, or someone else's servers. If there is something like a Far Cry style single-player campaign, then we'll talk. My assumption is that this won't be for me. The ONLY thing that might maybe keep me interested in a co-op game would be for this to be an official Wasteland spinoff. I'd be curious what that looked like. But that alone wouldn't be enough for me to buy it. Note that I am absolutely fine with the idea of "social integration" in a single-player game, like was originally planned for Wasteland 2. I'd friend list all you guys, compare achievements, compete on leaderboards etc. I just don't want forced multiplayer. I rarely consider multiplayer—anything; unless it's a particularly good RTS. Not a fan (even in the least) of multiplayer RPGs. 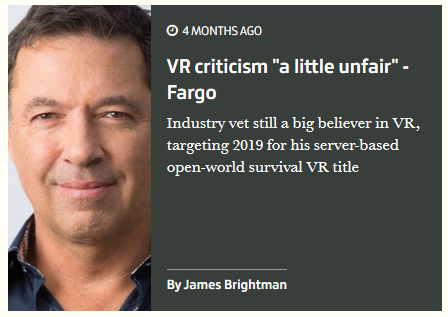 I don't think Fargo was ever opposed to doing those, but they required either money or know-how that inXile didn't have. Today, Gumi VR, the Japanese publisher’s VR subsidiary, announced that it’s investing $4.5 million in InXile Entertainment. This bundle of equity investment and project investment funding will go toward, among other uses, an unannounced RPG for Oculus Rift with Touch, HTC Vive, and PlayStation VR. Gumi CEO Hironao Kunimitsu also joins inXile Entertainment’s board. The unannounced open-world survival RPG, InXile CEO and founder Brian Fargo said, is based on one of the studio’s existing worlds — so it could be riffing off Wasteland, Torment: Tides of Numenera, or The Bard’s Tale (though it could also be Hunted: The Demon’s Forge, a fantasy take on the cover shooter that InXile made for Bethesda Softworks in 2011). Fargo’s interested in open worlds like those found in Ark: Survival Evolved, but InXile wants to add more RPG elements. At first glance, this may look like a weird partnership. InXile and its forerunners (Black Isle and Interplay) have decades of experience in Western role-playing games, while Gumi focuses on RPG mechanics that work in Asia. But Fargo points out that InXile’s recent VR work went a long way to securing this investment and partnership. The studio will be hiring to help augment its already talented design and development crew. That fits the job posting perfectly. The ONLY thing that might maybe keep me interested in a co-op game would be for this to be an official Wasteland spinoff. Signs are looking good I don't see them using Bard's Tale or Torment for an open world survival game. And the game could still have a "play alone on a private server" kind of option, like Conan Exiles. Re: inXile is making a server based VR survival game! Release 2019? Before Wasteland 3? That's fast! Main studio makes Wasteland 2 (Unity, isometric), then starts moving team members over to Torment (Unity, isometric), and then to Wasteland 3 (Unity, isometric). New Orleans makes BT4 and Mage's Tale (Unreal, first person, VR), then starts transitioning to this new title (Unreal, first person, VR). If BT4 gets delayed again, this game may slip to 2020 as well. Although survival games go into Early Access really quickly nowadays, so it depends on what you count as a "release". That makes me think of a fascinating possibility - could BT4 be published by Gumi? Dungeon crawlers are big in Japan, the CEO is on inXile's board of directors, and they've already agreed to publish another multiplatform title for them. Since Gumi is so interested in VR, I suppose it depends on the VR capabilities of BT4. OK, "server-based". Thanks for confirming multiplayer foolishness. I mean, what else would it have been? But still, good to know for sure. Wasn't Spore also server based?... and yet it was single player only. IIRC**, the server was used for the marketplace; and possibly as a source for the other life forms encountered. **I never really played Spore past the interpretive dance stage. Eh. A game like Wasteland 3 has a lot of reactivity and writing involved. Multiplayer survival game, not so much. You're reaching Spore drew creature data from (and transmitted it to) the central servers, but the environmental generation, player data etc. were all handled client-side. The game didn't take place "on the server". New Orleans makes BT4 and Mage's Tale (Unreal, first person, VR), then starts transitioning to this new title (Unreal, first person, VR). So it's a VR game? Well, my interesst wasn't high before that, it just droped to zero. VR just isn't for me.